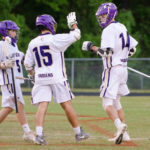 The East Coweta Indians’ lacrosse team had to stew for a year, but at last they got their redemption. 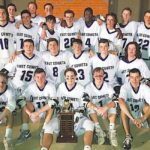 The Indians sprinted to a 5-0 lead in the first quarter and never looked back, defeating the Northgate Vikings 20-3 Friday night and winning the 2017 lacrosse Coweta Cup at Garland Shoemake Memorial Stadium. Almost annually, the Coweta Cup Tournament has been both the highlight and the completion of the high school season for boys lacrosse teams. East Coweta celebrated this year’s county crown on Friday at Garland Shoemake Stadium with a resounding 20-3 victory exactly a week after knocking off Newnan to complete a ‘worst-to-first’ turnaround in Cup play from last year. But another home game awaits the Indians to open next week’s Class 7A state playoffs. ECHS varsity lacrosse teams take on rivals Northgate High School tonight, in the second game of the Coweta Cup. In between the varisty girls’ game and the varisty boys’ games we will be hosting our 2017 Charity Event. 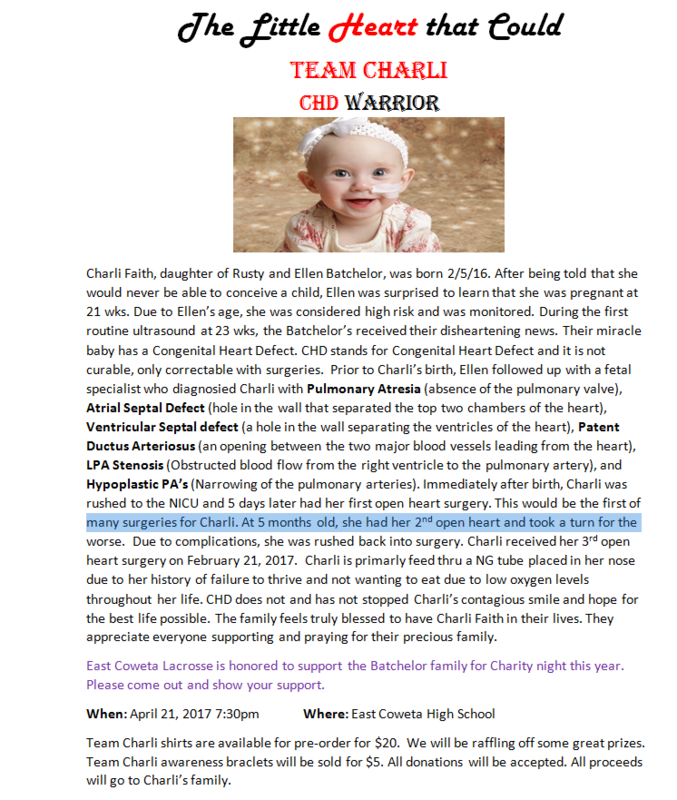 East Coweta Lacrosse is honored to support the Batchelor Family and Team Charli. Please join us begining at 5:30 at the Garland Shoemake Memorial Stadium. 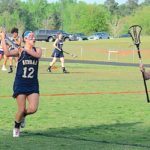 Coweta Cup play began in high school lacrosse Friday with two action-packed contests between county and area rivals Newnan and East Coweta at Garland Shoemake Memorial Stadium. The Newnan Lady Cougars managed to defeat the EC Lady Indians for the second year in a row while the East Coweta Indians didn’t blow a lead this year against their heated rivals.